In Division One, Park United got back to winning ways when they beat Billinghay Athletic 5-2, Tom Limb, Jimmy Harris (two) and Alex Limb (two) completing the scoring. Caythorpe were hit for six in Division Two by Spalding Harriers, Karol Narojczyk with a hat-trick and Rafel Marczewski (two) and Daniel Goddard on target. And in Division Three, Digby and Park United Reserves shared a 3-3 scoreline, while, Northgate Olympic’s home match with Old Dons Reserves was postponed. 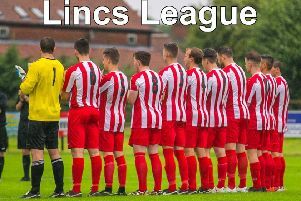 Workforce Unlimited Premier Division (KO 2pm): Coningsby v Ruskington Rovers, Pointon v Fulbeck United. Workforce Unlimited Division One: FC Hammers v Billinghay Athletic, Fosdyke v Pointon Reserves. Workforce Unlimited Division Two: Caythorpe v JFC Seniors. Workforce Unlimited Division Three: Northgate Olympic v Digby.